Recently, the tech community celebrated the 20th anniversary of Java. It’s one of the most widely adopted programming languages, used for over the past two decades and it is clearly not going go anywhere. Additionally, demand for Java Developers is great, especially for companies that work on the latest application projects and applets. By that logic, shouldn’t there be an overabundance of Java developers in the industry? And, shouldn’t there be so much money and time involved hiring the best Java Developers? Although hiring costs vary by industry and region, it is always surprising to see the bottom-line figure, after all, the costs have been factored in. The total cost of hiring one new developer could be as high as $5,000 or more. There are recruiting costs, training, benefit packages, equipment, and more than have to be factored into the equation. 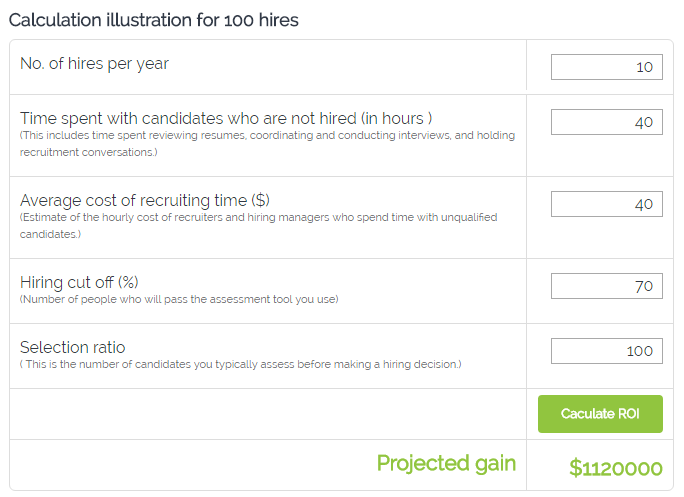 After a lot of research and inputs from customers, top thought leaders and reliable websites; Interview mocha, recruitment assessment tool has come up with more variables involved in calculating cost of a new hire. Where is your money and time draining out? The true cost of hiring a developer is much more than his salary. According to Bersin by Deloitte, it takes around $4000 to hire a developer. There are too many expenses associated with hiring include the recruiter’s fee, administrative expenses, interview expenses, test creation, workplace integration, bad hires, etc. These are all the external and internal spending for recruitment in the designated time period. The cost of simply attracting the right person can be hefty. 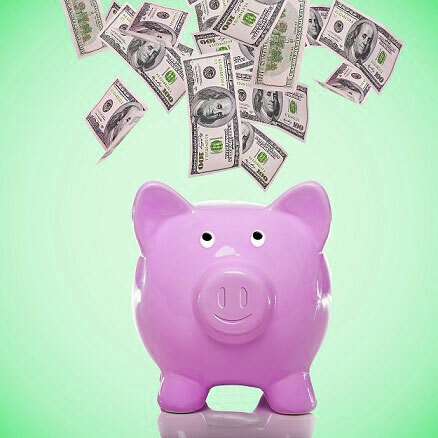 These costs add up to a major portion of your budget. The recruitment costs include administrative costs, third-party fees, such as agencies, advertising costs including job boards and social media, job fair and campus recruiting costs, travel expenses for recruitment, external assessments, background checks and drug tests. It takes a huge amount of time and cost for creating tests. Involving technical experts to create tests on the amount of their work can cost you way too much to an organization. Chances are, the tests will be created, but other things will fall by the wayside. If you have to pay travel expenses, that's costly. But if all your candidates are local, you still have to take the time and cost of recruiter's assistant in reviewing resumes and performing other recruitment-related tasks like calling and emailing candidates, do formal interviews, talk with colleagues, and figure out who is the best employee. Attracting the candidates and recruiting is just the initial step, bringing in the candidate and training him is the costlier thing of all. Training Expenses such as training and orientation, employment testing, travel, hotel and meals termination costs, unemployment and potential litigation expenses if the candidate decides to sue you for wrongful dismissal, plus relocation costs and outplacement or career transition costs. The cost of selecting the wrong person can run into thousands or even millions of dollars, not to mention the potential negative impact on a company’s morale and productivity. Unfortunately, making a bad hire can impact your revenue, your clients, your other employees and you in a variety of ways. Considering the results of a recent CareerBuilder survey, it costs more than $50,000 when US employers hired poor fit for their job role. Your company loses more than time, money and effort by recruiting, hiring and training people who perhaps shouldn't have been brought on in the first place. Another cost that shouldn’t be overlooked is the cost of workplace integration. There's also the cost of physical space as well as software, cell phone, travel and any special equipment or resources required for the job. No matter which recruitment methods you prefer, or what your budget is, your cost of hiring a developer should reflect on how you allocate resources to attract and hire the best talent. 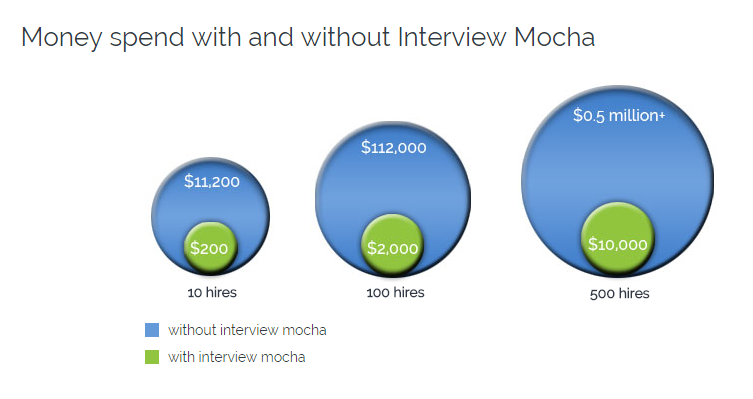 How can Interview Mocha help you save more than $1200 per hire? A business loses 6 employees in six months, averaging one per month. Six of these employees were entry level, with an average salary of $40,000. It costs, on average, $16,000 to replace each employee at 40% of their annual salary, for $96,000 total. On an average, it's going to cost your company $72,000 to replace the six entry level employees. With Interview Mocha, the above numbers will surely lower down. Want to see how? This can be proven with the Interview Mocha’s ROI Calculator. The most visible short term benefit of using Interview Mocha is the reduced administrative time and cost spent screening candidates. However, it is hard to estimate the actual value of a good hire or the cost of a bad one. But below are some basic formulas to assist with building budgets and business cases for the use of Interview Mocha as an assessment tool. ROI Calculator gives you a clear view of time and costs wasted on unqualified Java developers hiring. And below you can see how much you can save using Interview Mocha's pre-employment Java skill assessment test. Implementing Interview Mocha online java programming tests result in gains, using an ROI Calculator can help demonstrate the returns a company can expect after implementing Interview Mocha's Online Skill testing. What have Interview Mocha's Customers experienced after using java assessment test? The hiring speed of the companies has increased dramatically by creating a talent pipeline, where applicants are evaluated. Interview Mocha has helped companies to improve the time-to-fill candidates by 84% and 90% reduction in time for recruiting. With the help of Interview Mocha, companies are now able to streamline resume screening, which takes up a significant portion of the total recruiting time. Companies are now able to screen a double number of developers. The conversion ratio in the face to face interviews has increased by 70%. The calculation is simple, if previously companies were screening 2 candidates out of 10, now they are able to screen 4 to 5 candidates. And, now they spend time in assessing if the candidate will be a good fit for the organization. And all this results in money saved. Won’t you like to know how and with what all measures Interview Mocha help companies to cut the irrelevant costs in hiring java developers? Interview Mocha’s Java tests enable employers to identify potential hires by evaluating working skills and job readiness. For this reason, the emphasis is laid upon evaluating the knowledge of applied skills gained through real work experience, rather than theoretical knowledge. Interview Mocha efforts toward helping hiring managers to quickly conduct the pre-hire screening and assessment for java developers. Ready to use Java tests - Interview Mocha has ready to use java tests so that you can easily and efficiently assess candidates on coding skills. To help you narrow down here is the breakdown of most popular and latest Java ready to use skills test. While this isn’t an extensive list, it does provide insight into the most in-demand programming tests sought after by employers. Interview Mocha consistently tries to provide you with the relevant assessments of latest technologies. Custom Tests - You can also create custom tests as per your specific requirements. Type of questions - Interview Mocha’s skill test library has more than fifteen java tests which cover each and every topic and frameworks of java. Quality of questions - Interview Mocha has hundreds of java questions and each question is checked for its quality and correctness. Analytics - Using powerful analytics and reporting, you will have a detailed analysis of test results to help you make better decisions and predict candidate success. Coding Simulator - Interview Mocha provides Code Simulator for evaluating the coding style or knowledge of a candidate. This code simulator is available for seventeen different programming languages with basic to high-level question sets, including Java programming language. With every problem statement, four test cases are attached. With these test cases, Interview Mocha’s code simulator evaluates the code and assigns the score to candidate’s answers. Now assess the candidate's coding skills rather just relying on practical knowledge. Looking into what the future holds the increased demand for Java developers, Interview Mocha cares about the quality and importance of the analytics that you are hiring. Therefore, we make sure that you are guided in the process of selection of such. Interview Mocha advanced hiring analytics, assessment integration, and candidate ranking tools will help you streamline the selection process, ensuring best-fit and faster decisions. And, with Interview Mocha, your pre-employment testing analytics will be taken care of. 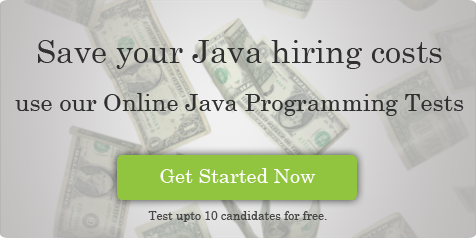 So why not just try it yourself and save $1200 this time when hiring for Java Developers! You can vouch for it.